I don't think I'll list every single one of the 64, instead I'll just list those that were, for me, standout titles. The thing is, it might have been an average year number-wise, but it wasn't average quality-wise. I could easily have listed another 20 superb reads. The fact is it's been a terrific year for me book-wise. 95% of what I've read I've really enjoyed and I certainly could not say that about every year. Choosing a book of the year is very hard but if I absolutely *had* to choose, it would be A Tree Grows in Brooklyn by Betty Smith. I loved, loved, loved it. But I've also loved continuing with the Mary Russell/Sherlock Holmes series by Laurie R. King and starting the Mortal Engine series by Philip Reeve. All in all, quite a memorable reading year for me. I only hope 2009 will be as good. And to finish this post off - a couple of pics of books I got for Christmas. Three books from folk who know my reading tastes perfectly. Stephen Fry in America was a Christmas gift from my youngest daughter, the book is based on his TV series of the same name of course. Nation by Terry Pratchett was from an online, and now RL, friend of about eight years, a big Terry Pratchett fan too. 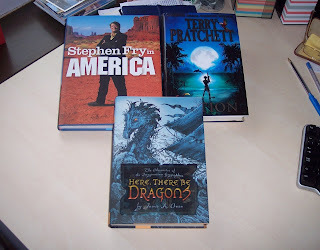 And Here, There be Dragons was from from my lovely friend, Deslily. These two came from a friend in Ohio. A gorgeous cookbook based on recipes used by the governors of Ohio through the centuries. Love it to bits. 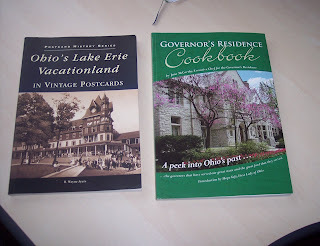 And the other is full of pics of Lake Erie, a lake we've been lucky enough to visit twice, the last time spending time at Put-in Bay, which is featured in the book. Fond memories. I had absolutely no idea, until Deslily reminded me, that it'd been nearly four weeks since I posted here. I haven't been reading, or rather I've started several books and got nowhere with them, so haven't had any books to post about. Add that to it being Christmas and thus, extra busy for me, plus I've been ill, and you get a long drawn out silence. Apologies. Once the Christmas madness is over I'll hopefully find something decent to read and get back to this blog. I'll certainly be doing a 'books I got for Christmas' post. Plus I still need to make a list of books about snow. And so I just want to wish the people who stop by this blog on regular basis, a Merry Christmas and a Happy New Year with this lovely vid of Enya singing Silent Night in Gaelic. I hope everyone has the Christmas that they wish for.